When using a public restroom, after I wash my hands, I need to dry them, right? One can’t go into the world with one’s hands dripping with water. That’s why we’ve got electric hand dryers that blow hot air. Personally, I prefer paper towels because it seems faster to me (5-10 seconds) than using the hand dryer (20-30 seconds), but sometimes they don’t give you that option, because that would require additional janitorial staff to come in and empty the wastebaskets filled with discarded paper towels. So, we have the hand dryers. You know what I love about hand dryers? Those hieroglyphical instructions that explain how to use them. In case you didn’t know. Step 1: Push the button. Step 2: Hold your hands under the warm air. Step 3: Shoot yourself in the head because you’re too stupid to live. What I like to do is follow the instructions exactly. I always make sure to push the button with my left index finger with my thumb extended just like in the picture. Then I hold my hands (motionless) under the hot air, exactly in the way the picture says. When you do this, it’s important that you don’t move your hands. Just hold them there. It’s funnier. After all, you’re just following directions. One of the dumbest (and very funny) web sites ever made is YoureTheManNowDog.com. It’s the ultimate pointless obscure joke that’s in the perfect tradition of IDWID. So, here’s my take on “Youre [sic] the Man Now Dog”: It’s called “Youre [sic] the Dryer Now Dog,” done in the exact style of a YTMND. Check it out. 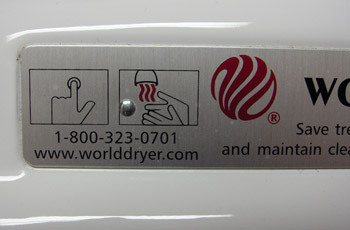 Public restroom hand dryer instructions: It do what it do. I’ll agree, US hand dryers are pretty weak. For any thorough drying, I’ve needed to push the button a few times because the airstream is too weak, the temperature isn’t hot enough, and the runtime is too short. Having just recently returned from a trip to Osaka and Taipei, I can tell you that in those cities, they know what they’re doing. I was only changing planes in Osaka and granted my sample set consisted of only the airport bathrooms, but their hand dryers put ours to shame. Put your hands under the sensor-activated vent (complete with drain to catch excess water) and it starts automatically. The airflow is nice and strong and the temp is much warmer than US dryers but without scorching. I could see the water run off my hands instead of just being evaporated. The dryer runs for as long as your hands are under the vent and dried much faster than US dryers. No buttons to push. My sample set in Taipei was larger, including various restaurants, shopping malls, standalone shops, subway bathrooms, others. Yes, the subways have bathrooms and they’re decently clean and maintained. The dryers there were similarly powerful and effective at drying my hands. Japanese toilets. They burn what they burn. 7 year old nephew received 2nd degree burns from bumping arm against one in his elementary school. you got it all wrong….